My trip to Christchurch for the opening of Rita Angus: Life & Vision went well. I’m pleased with the way the exhibition looks at Christchurch Art Gallery, especially as the exhibition designer and I worked the whole thing out on the phone and via email. By the time I got there the show was hung, and while there was one last minute change to be made, it all went very smoothly. Naturally Cass takes pride of place as the first work you see as you enter the exhibition. 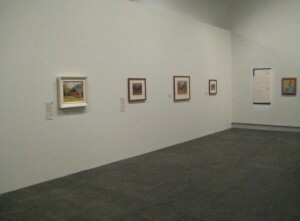 Rita Angus: Life & Vision at Christchurch Art Gallery. Front left, the gallery’s painting Cass. What’s interesting about putting a show like this on the road is that different venues produce a different experience of the works. A Goddess of Mercy, for instance, looked across a gallery to the final self-portrait in a way that drew interesting connections between the two paintings and was quite different from how they were hung at Te Papa. As well as those new sightlines and juxtapositions, it’s also interesting to hear the responses of a new audience. On the basis of comments heard and overheard at the opening and the following day, I think the show’s going to be a hit in Christchurch. This will be in no small part due to its conjunction with Miles: A life in architecture, a look at half-a-century’s work by Sir Miles Warren. While there was too much to see and read during my brief visit to the exhibition, it was good to be reminded of some of my favourite buildings. You can see many of these in the ‘chronology’ section of the Warren & Mahoney website. The folks at Christchurch Modern have also done a nice job of documenting some of the firm’s early domestic buildings, as well as other bits of my home town (for instance, I’d often wondered what this was). There’s also a cool self-guided tour of Warren & Mahoney’s Christchurch that’s available as a pdf from Auckland University’s Architecture Archive – an ideal companion the next time you’re pounding the pavements of the garden city.